St George - Canyon Essentials Course (ACE-L3) 'Intensive'! Improve your skills and expand your canyoneering toolbox! 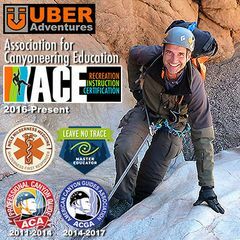 Uber Adventures' Canyon Essentials Course (ACE-L3) is designed to prepare some for organizing or leading canyons and others to simply increase the number of tools in their toolbox; specifically providing the next level of skills training through technical instruction and experiential practice. While these tools are a vital component for any active canyoneer, they are imperative for anyone leading rookies, kids, family or friends into a canyon. This course provides strategic training for unexpected technical and group management challenges ... when things don't go quite as planned! Prerequisites: Since this course builds upon the skills and techniques presented in our Technical Canyoneering Course (ACE-L1) AND our Advanced Canyoneering Course (ACE-L2), we recommend that you've either taken both courses or have significant relevant personal experience before taking this class (please inquire if you're unsure if this is the correct course for your current skill set). Required/Recommended Gear: Harness, Helmet, Rappel Device, Figure 8 for Rigging, Gloves, 5-6 HMS Screwgate Carabiners, 48" Sling or Foot Loop, Personal Safety Tether/Lanyard, Prusik Loop, Mechanical Ascenders, 25' of webbing, 20' Cordelette-optional or Canyon Cordelette-optional (and appropriate shoes and pack). Logistics: This course will be held on THURSDAY ... most of the course will be held at at my exclusive training site within the Virgin River Gorge near St George, Utah with a portion possibly held at a Picnic area in the Cedar Pocket campgrounds. There should be plenty of super-cheap camping at Cedar Pocket which is a first-come/first-served park, or you can make other lodging/camping arrangements on your own. Tuition: This Canyon Essentials Course (ACE-L3) is $395 per individual. A $100 deposit reserves your space in this class. The deposit is non-refundable and non-transferrable but may be put toward a future course in the same calendar year if 30 days notice are given cancelling your participation in this course. Feel free to post any questions on this event or send me a greeting/e-mail through meetup. Included with tuition is: A CERTIFICATE OF COMPLETION!! ACE Master Instructor/Certified Guide, ACGA Certified Guide, Officer and Instructor, Certified Tactical Rappel Master, Wilderness First Responder, Advanced Swiftwater Rescue Technician, Technical Rope Rescue Technician, Basic Mountaineering Instructor, Map & Compass Navigation Instructor and a Master Educator for Leave No Trace wilderness ethics.